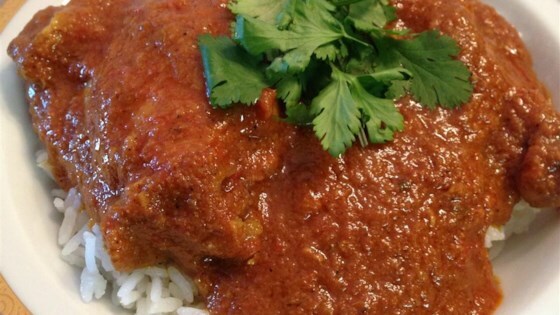 "Chicken pieces coated with many fragrant spices like turmeric, cardamom and cloves, then simmered in a tomato sauce. This dish is a family favorite. I have also taken it to potlucks and served it to guests in my home. Everyone asks for the recipe. It is a great slow cooker meal, too." Place onion, garlic and ginger in a food processor and process into a paste. Heat oil in a large skillet over medium heat, add onion paste and saute, stirring continuously, for about 10 minutes. Stir in the cumin, turmeric, salt, pepper, cardamom, cinnamon, cloves, bay leaves and nutmeg. Saute, stirring, for 1 to 2 minutes. Place chicken pieces in skillet and stir them around with the spice mixture until they are well coated. See how to make chicken thighs simmered with tomatoes and exotic spices. want to like it, but missing something....not salty enough. cooked it for 1.5 hrs and still not really right.